It’s been nearly a decade since I first came across the 4-part Attraction Planning Process pioneered by Jan Stringer. It was no coincidence. I connected with her first book, Attracting Perfect Customers: The Power of Strategic Synchronicity with lovely synchronicity through her first publisher, Berrett-Koehler, a client of mine. She had co-authored (as Jan Brogniez) and developed this 4-part process that brought the seeming magic of attraction to a business audience, and it was launched out of Houston. Texas. This 4-part Strategic Attraction Process, along with the fundamental idea that the very best marketing grew out of building great relationships, became part of the air I breathed. As the years unfolded, I came into Jan’s orbit, signed up for classes and learned more about this 4-part planning process through my own practice of it and with regular reminder classes that the “Biz Goddess,” Jan, offered with her sweetheart, then husband, Alan Hickman, a brilliant cheerleader of a coach in his own right. In 2009, Jan and Alan published a new, deepened message, BEE-ing Attraction: What Love Has to Do with Business and Marketing. Its cover includes the tagline, “A Guidebook for Developing a Heart-Centered Business and Life.” It’s a process that works (like magic) for all manner of relationships. With their new book and my deepening understanding in applying the 4-part plan, now sometimes called a “BEE-ing Attraction Plan,” the planning process that had been a traveling companion became an intimate friend. The varied stories in this book, shared through the voices of clients, create a level of specificity, spaciousness, and hope for all manner of sizes, shapes, and intents of plans — whether around growing a business, renting a dream house, or connecting with a soul mate. At the heart of their process, and Part 2 of the 4-part plan, is a deep-inner-connection process called, “What Makes You Tick?” The “tick” as it’s called for short, is the ultimate foundation on which your relationships stand. What makes you “tick” is like water to a fish — you may not recognize or realize that’s what it is. It’s what you bring to every encounter in your life, whether you know it or not. Its power grows from the idea that “like attracts like,” so what makes you tick is also what makes your most perfect client tick. Say the authors, “The Bee-ing Attraction Planning Process is about shifting paradigms. You must first become what you want to attract.” This whole new paradigm is unfolding under the nose of the crumbling infrastructure of the old way of business as usual. In this all-new business model, collaboration and cooperation take the lead over competition. It’s about bringing your heart to work and knowing that what Tim Sanders said is really true: Love really is the killer Ap. It’s about Being, Presence, Attraction, and Manifestation in their highest and best incarnations. For me, one of the most memorable take-aways, among many, “The qualities that impressed me in others were in reality resonating within me,” reports one client. This is a ray of hope for me and so many people like me who have second guessed ourselves for ages! For recovering perfectionists, you may wonder why your results don’t look like the ones in the book. Yes, I did too. “What am I doing wrong?” you may, like me, be asking. When you are sitting on the aisle of a 737 jet at 35,000 feet, you don’t realize you’re moving at several hundred miles per hour. So too, in delving deeply into playing with this Strategic Attraction Plan, it helps to surround yourself with what Julia Cameron calls “believing mirrors.” Only then will you realize the progress you are making. Far from sitting still, you may suddenly discover you are getting off the plane in another country, far from where you started. That is the power of putting the 4-part Strategic Attraction plan to work for you. Simple. But not easy. The plan calls on its users to go deep and bring forth the answers to the questions with radical honesty. And in so doing, miracles and magic do happen. With its success stories and practical guidance, plus detailed explanations of putting the plan to work, templates, samples, and inspiration for creating your own 4-part plan, this is a visionary and refreshing (woo-woo-free) approach to creating a heart-centered business that really fits. For those ready to step into, as client Doug Upchurch shares, “a different passion…[operating] from a different sense of ownership and power…” Bee-ing Attraction: What Love Has to Do with Business and Marketing is the perfect accompaniment. Disclosure: Over the past year, I have gone deeply into this process, both through the Strategic Attraction certification training (so I’m certified to offer you this 4-part planning process) and during extensive coaching with Jan and Alan to build my sales muscles and refocus on what exactly IS my heart-centered business. If you would like to taste this 4-part planning process with me, send me an email at bjmiddendorf (at)gmail(dot)com, and we can open the discussion. This is the first in a series of life lesson stories that illustrate the powerful and invigorating TURNAROUNDS that we are all capable of creating for ourselves, in the sacred circle of our words, reflection, and inquiry. Have you been on a journey of personal growth, spiritual development, and profound transformation for awhile now? Maybe you feel like something just isn’t happening; it’s incomplete; OR you feel like you should be there already? Maybe you’re tired because you feel like you have been on this journey your entire life. “There has to be a better and simpler way,” you think to yourself. Like you, I feel as though I have been journeying long and often alone. It’s been a precious voyage of inner discovery. And it has seemed like things have been “so close.” It’s like the mathematical asymptote: The line approaching the curve and never arriving. One day, I confided to my coach, Alan Hickman, that I felt exactly like a little puddle of ineffectiveness that wasn’t going anywhere. Thanks to Alan’s deep listening, reflecting, and training in inquiry, he stood with me in the sacred circle to turn it around. First, I owned that, “Yes. It’s true. I’m right now in a space of being not very effective.” Deeper inquiry told me a different story from what I’d been judging myself about and beating myself up for. The metaphor that arose in our discussion was the caterpillar. It had felt for so long like I was melting down from the inside, and I didn’t know who I was or what I was about. Everything seemed to be shifting and changing. Then the Ah-Ha. Suddenly I realized that I was indeed looking at the inside of the chrysalis. Here’s what I could now see: By loving and embracing the stuckness, the ineffectiveness, the right-where-I-am-ness, I was able to acknowledge myself for exactly where I am — like the butterfly looking out from inside the chrysalis. Observing myself with love and compassion, I can see that I am right where I am supposed to be. A few weeks after my conversation with Alan, this chrysalis narrative continued, as I continued to “notice what I notice.” As I practiced Qi Gong meditation in the garden on two separate days, a butterfly landed gently on my ankle. That was my signal to share this narrative. 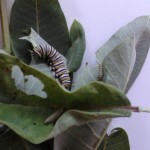 The butterfly wings are flapping to strengthen themselves for emerging from the chrysalis and getting ready to fly. Another message reaffirmed my understanding. A visit to Cirque Du Soleil’s brilliant “Ovo” show, provided the image of the chrysalis in an aerial interlude. 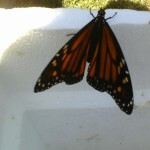 Pressing against the sheer fabric, the butterfly finally emerged high in the air, flapping its (her?) gossamer wings. And so, for midlife, best-half-of-life creators of all kinds, global transformers of consciousness, messengers, change agents, thought leaders, awakeners, authors, and healers: I send greetings and encouragement from the chrysalis. I’m with you when I say I know you are longing to step into your potential, to create transformative projects, businesses, creations, books, messages, ventures. I know you’ve been feeling for a long time stuck, stalled, scared, not good enough, or like you should be there already. Maybe you feel like you are trying to push the river to MAKE SOMETHING HAPPEN. What has been most surprising for me in this turnaround is that by embracing the stuck, stalled, scared puddle of ineffectiveness, I’ve literally changed my patterns and shifted the cellular experience of myself. It starts with an honest acceptance of, and even surrender to, exactly where you are right now. Realizing and embracing that you are still taking shape — you, your project, your creation, all together inside the chrysalis — creates a powerful self-recognition. More powerful still is to embrace your whole seemingly stuck self — completely free from judgment, and with love, appreciation, and gratitude. And so you can. It’s the best prayer and meditation ever. Some time ago, my colleagues in an entrepreneur support group asked me about Attraction Marketing. It really comes down to marketing from the inside-out. The writing projects, workshops, coaching conversations, Vision Quests, and mapping I do are all about taking that Inner Journey first. I wanted to share the following questions with you so that you can start making your own Strategic Attraction Plans. Who are your perfect just-right people (tribe)? Who do you envision inviting, joining you in your circle? Who are the people you want to cross the bridge of your words? This Strategic Attraction process will help you clarify and specify so that your light will be attractive to the people who are most perfect for your services and products. Start by identifying WHO is the first relationship you are focusing on attracting with your 4-part Strategic Attraction Plan. Do a separate Attraction plan for each of the different relationships you want to attract. Write each of the following four questions on a separate sheet of paper to give yourself plenty of room to expand your plan and NOTICE what comes up. This plan is to attract MY perfect ________. The process can work for whomever you want to attract, any and every kind of relationship — both business and personal. LIST #1 DESCRIBE The QUALITIES of your perfect _____________. This one can literally fill a notebook. Or two. This is not the place to be stingy! EVERYTHING that you notice that is a perfect quality goes on your plan. What makes my perfect [fill-in-the-blank] __________ tick? This may eventually be honed down to a very brief and powerful statement that gets at the core of who you are and why you are here. List #3 SPECIFY What YOU WANT them to EXPECT of you? What do I WANT my perfect [fill-in-the-blank] __________ to expect of me? This is where you decide what it is you really want to experience in the relationship. What YOU WANT … to do or experience in the relationship. Who do I need to BE for me to receive what I say I want? What Would Be More Perfect? Plus you can click here to Learn more about Attracting Perfect Customers! I am so excited to report that I am getting certified as an Attraction Strategist (Also known as a BEEing Attraction Wizard), and going more deeply into learning this 4-question Strategic Attraction process so that I can share it. I invite you to play in this field of attractive magic! As one of my colleagues reported, you too will be shedding your invisibility cloak! The prior post suggested that readers build a bridge from their vision to their tribe. On the one side, you have your vision, your creation or your business. Then there are the people you serve. I characterize the “bridge” as the message of your vision or business, put into irresistible marketing language (that also embodies the authenticity of YOUR voice) then opens the way for your perfect tribe to hear it, take it in, and take action on it. My friend from #blog30, Melanie Kissell, noted in her comment on the post Build a Bridge from Your Vision to Your Tribe, “Take your vision, go find a guide, and build your bridge!” And Rob added to the comments saying he was still looking for his guide. Well, I know how painful that can be. Realistically I know the temptations that lurk with every magnified online make-a-quantum-leap-in-10-seconds-or-less-while-on-a-private-jet-and-making-millions offer. I have also learned that, while such programs may actually be a good fit for some people, they have never been effective for me. It’s OK. And there’s nothing wrong with YOU if some of those hyperinflated sales page claims strike you as a bit, um, unrealistic. Tempting, but you know better. Even with the other guides who are realistic, hard-working, diligent teachers and coaches, even with “the good guys” so to speak, even within that group, not every guide is a good fit for you, your vision, and your creation! Think back about all the times you’ve heard certain pieces of advice. You’ve heard the basics over and over again. Yes, part of it is repetition, a proven way to learn. But another part is how one person may say something just a little bit differently, and BOOM! That person’s expression of the same advice really hits you, really sinks in. Who is your right bridge-building partner? Because the essence of building that bridge is taking action, stepping out into the void to create the connection between your vision and your people. Here’s how I’ve painted the picture of the people who might best hear it from me. If you resonate, be in touch! And if you’ve found your own right guide to help you build the bridge and open up the path for your just right perfect clients, share with us how you found this person and why they’re a good fit for you! It’s useful for all of us to see and hear about successful connections. What will it take to bring spine tingling delight to your people, your perfect customers, clients, to your tribe, circle, audience, community, readers, viewers, listeners? Following this Write Synergies Path, we’ve traversed the inner path of awakening awareness. We’ve added accountability, built momentum (inner and outer) for your foundation, and we’ve talked about creating and implementing. But who is it all for? And how can you create your vision in such a way that it really resonates down to the tippy toes of your perfect people? People talk about niches, of not trying to serve the whole world. But that often feels, in particular for the heart-full soul-preneurs, visionaries and thought leaders who don’t want to leave anyone behind, that they are being forced into a box that they’ve worked so hard to get out of, the smallness box. You don’t want to leave anyone behind, and you resist forcing yourself and your message back into a tiny, ill-fitting box. Reflect back to your own experience working with people. You know there are certain people who are more fun to be with, people with whom it’s hardly “work” at all to serve them, to offer your products. These are the people who need to “hear it from you,” as Jan Stringer and Alan Hickman like to point out. (You also know in your bones that there are people for whom the whole thing is just an uphill climb. Those may be the clients who need to hear the message from someone else, not you!) The people who can only hear it from you: This is the essence of a niche — your tribe. There’s something compelling about the basic idea of like-attracts-like, the law of attraction. In the coaching I’ve had with Jan and Alan, co-authors of BEE-ing Attraction: What Love Has to Do with Business and Marketing , and with their BEEing Attraction work, this like-attracts-like principle leads to a “trick” question. You ask, “What makes my perfect customers/clients tick?” As it turns out, it’s probably the same thing that makes you tick. Hmmm. So in essence you are creating your business or program or service that addresses a singular challenge or obstacle that you have somehow successfully dealt with for yourself. The delight comes, on your customers’ side, when they so totally “get it” that you “get them” and their obstacle. They see themselves reflected in the words on your site or that they hear in your teleseminar or in your conversations. They know that you have a deep understanding, not only of the pain of the obstacle, but also the solution to release that pain. That is the beginning of the delight. And there’s more. More than even the solution to their problem or a way to address their challenge, what they most appreciate is your Presence, loving them and their problem, loving offering the solution, listening for their particular nuances. Developing Presence in your own way, your authentic content and presentation and voice, creates a dramatic result, a Presence you can share with your customers. By taking the time to develop yourself on this inner path work, you have more to offer the people you are here to serve, and you will be serving them at an even more profound level. Your Presence — in your words, in your articles, blog posts, videos, audios, in your conversation — is a source of delight to the people who need to hear it from you. It is the deep listening that you bring to your client interactions. It is the deep understanding and empathy that you have for the challenges they are going through. It is your authenticity and the love that you bring to heal the pain of the obstacle, problem, or challenge by offering your services and products as solution. And at the foundation of your products and services: It’s you. Your Presence, honed to a crescendo of power to be totally with your clients, meeting them wherever they are on their path. Delight is a pale imitation of what they will really feel when you, your Presence, is completely in the moment with your clients. As my mentors, Judith and Jim say, “It’s all in the connection.” Developing your Presence is the path to creating the connections that matter. Copyright © 2011 Write Synergies Copywriting. Powered by WordPress and A Dream to Host theme by Art of Blog.